I am a totally last-minute person when it comes to the holidays. This is an insanely busy time of year for me work-wise, and I tend to save the majority of my making and purchasing of gifts until the week before. I also almost always stay up most of Christmas eve night wrapping presents. 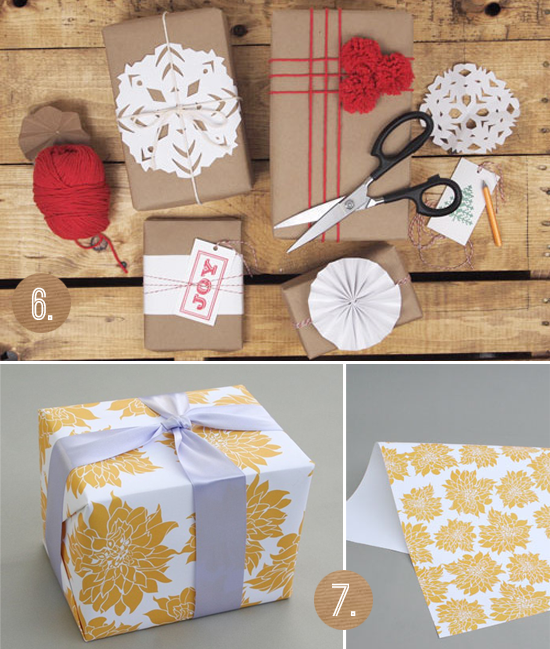 Along the way, however, I love searching for inspiration on pretty ways to package my gifts. I also try very hard to reuse as much as possible and to make each package one-of-a-kind, so it's helpful to have some ideas collected along the way. These are some of my favorites so far this year. I hope you like them too! 1. A vintage gingham shirt used as wrapping paper and a vintage brooch for a bow = perfection. You nailed it, Country Living. 2. This handmade typographic wrapping paper is basically my dream come true. 3. Such a simple concept, but such a stunning package. Handmade red snowflake (you can make your own via How About Orange) atop simple kraft paper and tied with white string. 4. Black and white stripes against bold green ribbon looks so modern and chic. Love. 5. How awesome is this Christmas light bow? 6. I adore this packaging DIY from A Pair of Pears. Simple, elegant, and so easy to reuse materials you already have! 7. This gorgeous non-traditional paper from Arboreal is also eco-friendly. I'd love to mix some pieces of this in with recycled kraft paper. Are you a last-minute type like me when it comes to holiday shopping and wrapping, or do you get it out of the way early? Oh my goodness, you are so inspiring! I LOVE these. I especially, really truly love the name stamped gifts. :D So pretty yet simple! That typographic paper is awesome! I might need to try that out. Inexpensive and you don't have to have tags for the names! LOVE LOVE LOVE your work! I hope you can take a moment to check me out. For I love to inhale and exhale inspiration. You can follow me in the footer. This old shirt wrapping is a nice idea. I wonder if it's hard to open. The first one is totally crazy! Wrap it up in another present?! Awesome! These ideas are so pretty. I love the one with the Christmas lights and also love the one with the names on the front. Simple and classy.